Last week a selection from Dutch national team players and professionals played a pair of exhibition games against the Netherlands Antillean National Team, which will take part in the South American Games next month in Colombia. The squad with current Major and Minor Leaguers was victorious in both games. In the first match last Friday they scored nine runs between the sixth and eighth en route to a 9-5 win. On Tuesday they prevailed 3-2. According to the report on Honkbalsite.com, Jair Jurrjens, Shairon Martis, Diegomar Markwell, Kenley Jansen, Dennis Neuman and Ashwin Asjes split the time on the mound in game one. In the second, Martis, Markwell, Jansen, Neuman and Asjes were accompanied by Edelcurny Jansen. 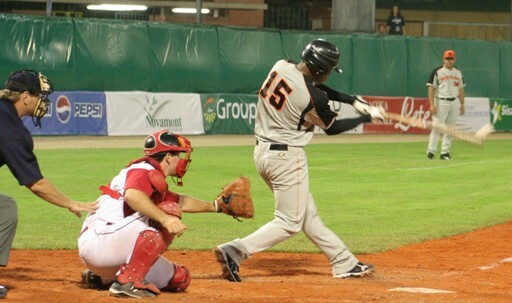 Wladimir Balentien set the offensive highlight with a homerun in game one. Also on hand were Randall Simon, Yurendell De Caster, Sharlon Schoop (picture) and Curt Smith.